We've polled our staff for their favourite books of 2015 and came up with enough graphic books to warrant a post of their own. Enjoy! Recommended by Joanne; Amy M.: "A continuation of her "Hark! 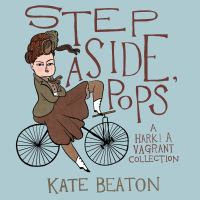 A Vagrant" collection of comics that parody famous historical, literary, and pop culture figures. I loved this book, and have been recommending it to friends and family. The jokes are hilarious, and she covers such a broad range of literary/historical subjects that you find yourself LEARNING just as much you're laughing." Recommended by Elinor: "A terrific wrap-up of the story of human survivors in a post-apocalyptic world where magic and the Fae come back after most of humankind is gone." Recommended by Emma & Elizabeth: "Super fun and feminist story of a summer camp. Amazing art style!" "Best friends Jo, April, Mal, Molly, and Ripley spend a fun summer at Lumberjane scout camp where they encounter yetis, three-eyed wolves, and giant falcons while solving a mystery that holds the fate of the world in the balance." --From publisher. "While Gwendolyn and Lying Cat risk everything to find a cure for The Will, Marko makes an uneasy alliance with Prince Robot IV to find their missing children, who are trapped on a strange world with terrifying new enemies"--From publisher.
" A brand-new, booze-soaked tale of the Rat Queens reveals a growing menace within the very walls of Palisade. And while Dee may have run from her past, the bloated, blood-feasting sky god N'rygoth never really lets his children stray too far." --From publisher. "Nimona is an impulsive young shapeshifter with a knack for villainy. Lord Ballister Blackheart is a villain with a vendetta. As sidekick and supervillain, Nimona and Lord Blackheart are about to wreak some serious havoc. Their mission: prove to the kingdom that Sir Ambrosius Goldenloin and his buddies at the Institution of Law Enforcement and Heroics aren't the heroes everyone thinks they are. But as small acts of mischief escalate into a vicious battle, Lord Blackheart realizes that Nimona's powers are as murky and mysterious as her past. And her unpredictable wild side might be more dangerous than he is willing to admit"--From publisher.